I'll be on the road Sunday-Tuesday with few opportunities for blogging or email. But Gavin will be on the job and I'll start to catch up myself on Wednesday. Posted by Peter Suber at 3/15/2008 11:33:00 PM. The implementation of the mandate to deposit all UZH publications on the institutional server is under way. ZORA currently has 2241 documents with 35% "legal" full-text papers. There has been a delay due to the change of platform. Posted by Peter Suber at 3/15/2008 06:31:00 PM. Posted by Peter Suber at 3/15/2008 04:42:00 PM. If you recall, last month the Council of the European Union agreed that the EU "needs to create a 'fifth freedom' - the free movement of knowledge" (beyond the four freedoms guaranteed by the EU Treaty to assure the movement of goods, services, capital, and labor). But in elaborating what the "free movement of knowledge" meant, the ministers did not mention OA, even though the original documents behind the idea tied it explicitly to OA. facilitating and promoting the optimal use of intellectual property created in public research organisations so as to increase knowledge transfer to industry, in particular through an "IP Charter" to be adopted before the end of the year and encouraging open access to knowledge and open innovation. Update (3/19/08). Also see Ziga Turk's new post on the language of the press release. Posted by Peter Suber at 3/15/2008 08:50:00 AM. The Open Knowledge Definition has been translated into Slovenian. Posted by Peter Suber at 3/14/2008 05:02:00 PM. Posted by Gavin Baker at 3/14/2008 04:43:00 PM. Scientists who want to describe their work on Wikipedia should not be forced to give up the kudos of a respected journal. So says a group of physicists who are going head-to-head with a publisher because it will not allow them to post parts of their work to the online encyclopaedia, blogs and other forums. The authors of the rescinded papers and 38 other physicists are calling for the APS to change its policy. "It is unreasonable and completely at odds with the practice in the field. Scientists want as broad an audience for their papers as possible," says Bill Unruh at the University of British Columbia in Vancouver, Canada, who has been lobbying separately against strict copyright rules. Gene Sprouse, editor-in-chief of the APS journals, says the society plans to review its copyright policy at a meeting in May. "A group of excellent scientists has asked us to consider revising our copyright, and we take them seriously," he says. Some publishers, such as the UK's Royal Society, have already adopted copyright policies that allow online reproduction. I can't tell from the article exactly what the physicists want to do on Wikipedia. If they want to describe their theories or results in new words, then no permission from a publisher should be necessary, and no copyright transfer agreement should stop them. If they want to post large chunks of their published papers verbatim (chunks that exceed fair use), they'll probably run afoul of Wikipedia's rule against original research. I think I'm missing something, and would appreciate any clarity on what it is. APS allows postprint archiving. If it allows full-text peer-reviewed manuscripts in OA repositories, why not large chunks on Wikipedia (assuming Wikipedia has no objection)? Does APS object, or does it merely have to revise its contract language? Nor can I tell exactly what happened at Physical Review Letters. Is it true that APS "withdrew its offer to publish" the articles just because the authors "asked" for a more liberal license? (I've never heard of that happening anywhere.) Or did the APS deny the request for a more liberal license, and stand by its offer to publish under the original terms, leading to an impasse in which the authors withdrew the articles? Related: Chemists recently had a run-in with Chemical Abstracts Service over the use of proprietary CAS Registry Numbers on Wikipedia. But after just one week of tussling (March 5-12), CAS changed its position and allowed chemists to use the CAS numbers on Wikipedia. Update (3/19/08). Thanks to Mathias Schindler for this piece of the puzzle: the physicists in question are interested in posting their work to wikis other than Wikipedia, where there are no rules against original scholarship. For details, see Jonathan Oppenheim's explanation (undated, but last revised March 15). Update (3/19/08). Also see the short article in Library Journal Academic Newswire. Update (5/20/08). Also see Robin Peek's article on it in the May issue of Information Today. The article isn't OA at the IT site yet, but there's an OA edition at LinuxInsider. Posted by Peter Suber at 3/14/2008 04:06:00 PM. Lauren Pressley, Open Access Notes, lauren�s library blog , March 13, 2008. Blog notes from an inter-library workshop on scholarly communication at Wake Forest University. Posted by Gavin Baker at 3/14/2008 03:17:00 PM. John Dupuis, Interview with Bora Zivkovic, Crazy Uncle of the Science Blogging Community, Confessions of a Science Librarian, March 13, 2008. Zivkovic is the author of A Blog Around the Clock and Online Community Manager for PLoS ONE . ... When, how and why did you become a believer in Open Access publishing? In discussions of Open Access on science blogs, at meetings, between scientists and publishers, most people talk about Gold, while sometimes we librarians seem to prefer the Green approach to Open Access. Given the recent Harvard announcements about the Green approach, what's your current feeling about the balance between Green and Gold? Back in grad school I was a fanatical downloader and reader of scientific papers. I read papers old and new in my field, in several related fields, and in some unrelated but interesting fields. I read, carefully, several papers per day. Then, a few months after I left grad school and started science blogging, my password expired for the school library and suddenly I realized what I never thought of before -- papers are actually NOT free and available for everyone to read. And I needed my daily dose of papers, both for blogging and for my, at the time, illusion of writing a Dissertation. I had to resort to begging friends for PDFs. When I look back, even to the early days of my science blogging, more and more of my blog posts were about papers in OA journals, mainly PLoS Biology (to which e-mail I was subscribed from the very beginning of the journal's existence). Comment. This interview is a role-reversal from last month, when Zivkovic interviewed Dupuis. Posted by Gavin Baker at 3/14/2008 03:10:00 PM. ... For years, many authors have made their papers available on their own web sites, but the practice is haphazard, non-archivial, and, remarkably, actively discouraged by the restrictive copyright policies of many journals and conferences. So USENIX's step is important both substantively and symbolically. It reinforces why scientific papers are published in the first place: not as proprietary revenue sources, but to advance the state of the art for the benefit of society as a whole. Unfortunately, other major technical societies that sponsor conferences and journals still cling to the antiquated notion, rooted in a rapidly-disappearing print-based publishing economy, that they naturally "own" the writings that volunteer authors, editors and reviewers produce. These organizations, which insist on copyright control as a condition of publication, argue that the sale of conference proceedings and journal subscriptions provides an essential revenue stream that subsidizes their other good works. But this income, however well it might be used, has evolved into an ill-gotten windfall. We write scientific papers first and last because we want them read. When papers were actually printed on paper it might have been reasonable to expect authors to donate the copyright in exchange for production and distribution. Today, of course, such a model seems, at best, quaintly out of touch with the needs of researchers and academics who can no longer tolerate the delay or expense of seeking out printed copies of far-flung documents they expect to find on the web. Organizations devoted to computing research should recognize this not-so-new reality better than anyone. It's time for [Association for Computing Machinery] and [Institute of Electrical and Electronics Engineers] to follow USENIX's leadership in making scientific papers freely available to all comers. Please join me in urging them to do so. Posted by Gavin Baker at 3/14/2008 02:57:00 PM. Certain papers from past conferences are currently available OA from the USENIX site. Posted by Gavin Baker at 3/14/2008 02:42:00 PM. Alan Boyle, New brain map on tap, Cosmic Log , March 13, 2008. With the backing of a billionaire, researchers today launched a project that builds on their earlier atlas of the mouse brain and goes after a challenge 2,000 times bigger: a 3-D genetic map of the human brain. And that's not all: They're planning to produce a similar map of the mouse spinal cord, as well as another atlas showing how the mouse brain develops from the fetus to adulthood. The multimillion-dollar effort could help researchers develop new treatments for maladies ranging from spinal cord injury to autism. [Chief scientific officer Allan] Jones emphasized that the data from the three new projects will be freely available over the Web, just as the mouse-brain database is today. Unlike most scientific projects, the Allen Institute doesn't hold back the raw data for its own big publication, but rather puts everything it has into the database as soon as it's available. See also past OAN posts on the Allen Brain Atlas. Posted by Gavin Baker at 3/14/2008 02:35:00 PM. Posted by Gavin Baker at 3/14/2008 02:17:00 PM. I've been thinking a lot recently about the availability of books in online searchable repositories, and the likely outcomes for publishers, libraries, and the public. Most particularly, I have been considering the impact of a possible settlement between publishers, authors, and Google involving the books that are currently under litigation in the Google Book Search product. What might break the logjam of access to these works, and frustrate the otherwise inevitable near monopoly of access that Google might obtain through a court proposed settlement? A digitization agreement involving universities and a suitable hosting service that would make this lost material broadly available on reasonable terms, with clear benefits that facilitate research and education, would make a strong counterpoint. Posted by Gavin Baker at 3/14/2008 01:56:00 PM. As many of my readers will already know, I have recently decided to leave my position of Director of Open Access at Springer for that of CEO of Knewco Inc. Several reactions that I have since received indicate to me that my move is not necessarily understood by everyone, and I’ve even seen speculations that my leaving open access might mean that it is not going anywhere at Springer. Let me say the following to that. First of all, OA has developed some very solid roots within Springer and I am most confident that OA is being further developed with alacrity by my successors at Springer. Secondly, I don’t feel that I am leaving open access....And open access is only one of the ways in which the speed, efficiency and quality of scientific discovery can be enhanced. If the underlying motive is, however, to get the most out of the scientific knowledge that has been gathered, which it is in my case, then moving on from open access to the semantic web – the concept web, if you wish – feels, at least to me, an entirely logical step. Not all knowledge after all is captured in journal articles. There is much more besides those, in databases, for instance, and in less formal web conversations. (A case can even be made that journal publishing ‘destroys’ data, for instance by reducing them to simple pixels in graphs, taking away the underlying richness of the data). Also, the connections between knowledge fragments are not always easily made purely by reading journal articles, in may areas a problem exacerbated by the sheer numbers of articles published. And all relevant. We are in a situation of overwhelming – and growing – abundance of scientific information, and methods that deal with that abundance are clearly needed. This is what Knewco people are working on, and I am very excited to join them. PS: For background, see the original Springer announcement and my comments. Posted by Peter Suber at 3/14/2008 01:23:00 PM. In a startlingly swift fall from grace, the new Academic Editor in Chief of PLoS Biology Jonathan Eisen resigned Wednesday after getting caught in a pay-for-access scandal that made a mockery of his straight-arrow “open access only” image and left him facing the prospect of criminal charges and perhaps permanent exclusion from journal editorial boards. Posted by Peter Suber at 3/14/2008 12:50:00 PM. This draft motion is in response to the green paper, The European Research Area: New Perspectives, by EU Research Commissioner, Janez Potocnik, April 4, 2007. See my blog comment on the green paper at the time it was released, my comment when the public comments on the green paper (overwhelmingly supporting an OA mandate) were released in October 2007, and my most recent comment last month when the Council of the European Union supported the general conclusions of the green paper but without mentioning OA. (Also see my other past posts on the green paper.) The new draft motion to the European Parliament doesn't call for an EU-wide OA mandate, as the public comments on it did. But it does endorse OA as a way to improve the dissemination of research. Should we count ourselves lucky? Does anyone know what has become of this draft motion since October? If it has not yet been introduced, does anyone know how to influence its shape before it is introduced? Update (3/15/08). The draft motion was revised and adopted on January 31, 2008. I even blogged the adopted text with comments at the time --something I didn't realize yesterday when I was only looking at the original version of the language. Thanks to David Prosser, Director of SPARC Europe, for sending me the revised text. Note how the new draft weakens the original: instead of endorsing open access, it endorses experiments and the importance of respecting IPR. The diluting amendment was proposed (p. 18) by Teresa Riera Madurell, Jorgo Chatzimarkakis, and Alejo Vidal-Quadras. Posted by Peter Suber at 3/14/2008 12:38:00 PM. Agôn is a new French-language, peer-reviewed OA journal on the performing arts. Posted by Peter Suber at 3/14/2008 12:05:00 PM. There's a good discussion thread on LibLicense in response to Heather Morrison's suggestion that librarians should take a journal's policy on author rights and OA into account, as one factor among others, when deciding whether to subscribe or renew. Librarians can go even further than taking journal access policies into account. They can demand better access policies when negotiating licensing terms for subscription or renewal. OhioLink has done this since 2006. (OhioLink is a consortium of 86 academic libraries in Ohio representing more than 600,000 faculty, students, and staff.) In a May 2006 document, it said: "In parallel with individual author action, OhioLINK will seek to add a clause to its licenses with publishers in its Electronic Journal Center. This clause will seek to automatically provide the recommended self archiving and access rights to all personnel of Ohio higher education institutions." I know of at least two major universities trying to do the same thing, but so far without making their efforts public. All universities should do what they can to negotiate better terms for their authors, not just better terms for their readers. Posted by Peter Suber at 3/14/2008 11:32:00 AM. France is to launch its challenge to Google's book search next week. French Culture Minister Christine Albanel said today (12th March) that a pilot scheme for the Gallica 2 digitised book project would go live immediately after the Paris Book Fair, which opens on Friday (14th March) and runs for six days. Comment. The article doesn't make clear what's different about Gallica 2 vs. Gallica. I can't find an announcement on the Gallica site, and I can't reach the Ministry of Culture site, so I guess we'll find out on Friday. See also past OAN posts on Gallica. Update. After reviewing the relevant documents (1, 2, 3), I still can't tell what's new about Gallica 2 or what its relationship is with Gallica. Update. It appears Gallica 2 is indeed the next version of Gallica, with the intention that the new version will permanently replace the old at the end of 2008. Gallica 2 will add new types of works (such as magazines and newspapers) as well as changes to the interface, including the ability to search full-text inside books. A description in French is here (thanks to Jean-Claude Guedon). Posted by Gavin Baker at 3/13/2008 05:33:00 PM. Jan Dawson, two roads to open access science information, 7/8 librarian , March 12, 2008. Posted by Gavin Baker at 3/13/2008 05:22:00 PM. Comment. The announcement for Ocular Biology says the journal "will be available via open access through 2009". Does that mean it won't be OA after that time? Posted by Gavin Baker at 3/13/2008 05:03:00 PM. OA is "the new normal"
Roger Cullman, Michael Geist on E-publishing and the Law, blogTO , March 12, 2008. One of these initiatives involved the Canadian Medical Association Journal (CMAJ), after a dispute with its editorial board over what they perceived to be editorial interference from the CMA said Geist. "They are now actively publishing under a Creative Commons license to not only make copies, but to build on the research and data that gets posted. They have found that they are doing things with Open Medicine that they simply couldn't do with the CMAJ. Posted by Gavin Baker at 3/13/2008 04:44:00 PM. JISC has a podcast on Welsh Journals Online. The podcast, dated March 11, is an interview with project director Arwel Jones. More information on the project is available from JISC or the National Library of Wales. The two pages disagree on the details, but the project will apparently digitize and provide OA to hundreds of thousands of pages of post-1900 Welsh publications, in Welsh and English. Posted by Gavin Baker at 3/13/2008 04:27:00 PM. Ian M. Johnson and Virginia Cano, Electronic publishing in librarianship and information science in Latin America � a step towards development? ... Over the past thirteen years we have moved from a very local journal, publishing working papers on the work of the Department of Information Studies at the University of Sheffield, first to a fully peer-reviewed journal and on to a journal covered by all of the major indexing services, including the Web of Knowledge, to one whose 'impact factor' challenges the established journals and surpasses many of them. There is no doubt in mind that this latter phenomenon is due in no small part to the fact of the journal being freely and openly available on the Web. Before about 1995, electronic journals took the form of rather crudely produced text files accessible by ftp or delivered by e-mail. In those circumstances, open access journals could not flourish. 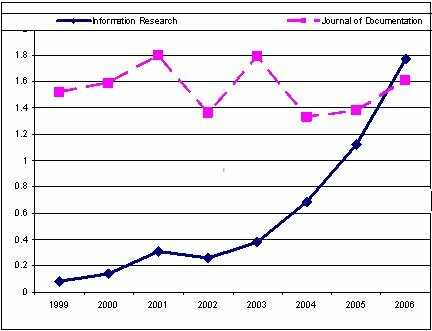 The Web changed all that and the production values of open access journals compete with, and in many cases exceed, those of the commercial publishers. The fact that many open access journals use HTML files rather than pdf, which is adopted by all commercial publishers, is, to my mind, a major element in their success. HTML files are easily manipulated in a browser, require no additional 'reader' than the browser, and are fully searchable. Consequently, the papers are found by the search engines and tend to be cited more readily and faster. Posted by Gavin Baker at 3/13/2008 04:08:00 PM. The Open Knowledge Definition has been translated into Basque. Posted by Peter Suber at 3/13/2008 12:30:00 PM. Last week I blogged the controversy surrounding the decision by Chemical Abstracts Service not to allow the proprietary CAS Registry Numbers to organize the growing body of chemical information on Wikipedia. I think this is excellent....For CAS to offer support to the Wikipedia team for the curation project is, for me, an indication of commitment to public service and I am indebted to the participants in this decision....My sincere appreciation is extended to the CAS management team and decision-makers. My gratitude to WP:Chem for staying engaged in the conversation to get to this outcome. My encouragement to us all to get this project done and have a high quality validated dataset of chemicals available as a public resource. Onwards and upwards! ...I add my thanks - especially in what could have become polarized. It is good news for us in Cambridge as we are building a molecular repository of common chemicals and the CAS number is a valuable linking tool orthogonal to trivial names, systematic names and connection tables. Comment. Kudos to CAS for changing course and kudos to the open chemistry community for raising the issue and pressing for a solution. Posted by Peter Suber at 3/13/2008 12:27:00 PM. Andrea Foster, U. of Iowa Writing Students Revolt Against a Plan They Say Would Give Away Their Work on the Web, Chronicle of Higher Education, March 13, 2008 (accessible only to subscribers). Graduate students in the University of Iowa's writing programs are up in arms. A new university procedure, they fear, will make their novels, plays, and other creative works "done as dissertations" freely available on the Web. That could undermine the commercial value and possibly embarrass the authors, they charge. The controversy has hit the blogosphere. James Hynes, a novelist who graduated from a writing program at Iowa, said on his blog on Tuesday that the new form alarmed him because creative works are fundamentally different from dissertations in the sciences or related fields. In academic communities, Open Access has potentially huge importance, allowing scientists and scholars to easily gain access to the work of their colleagues. After all, scholarship in nearly all fields is built upon the work of scholars that went before. Of course, the Iowa writers are arguing, with creative work, the calculation is different. Writers learn from reading other writers, but a novel doesn't cite previous novels explicitly. Ernest Hemingway doesn't direct his readers via footnote to Sherwood Anderson, for example. And so, the Open Access framework would appear to be flawed when it comes to theses produced by the students in the Iowa Writers Workshop, as it is both irrelevant to their discipline and potentially damaging to their future careers. I defend OA for electronic theses and dissertations (ETDs) and even argue that universities should mandate OA for ETDs. On the other hand, my arguments focus on non-fiction works of scholarship in the sciences and humanities. I've never thought about OA for works of fiction and creative writing submitted for degree requirements in an MFA (Master of Fine Arts) program like the Iowa Writer's Workshop. I suspect that many universities with OA policies for ETDs haven't either. However, in my argument for mandating OA for ETDs, I make a point of adding that "[g]rad students who have good reasons to be exempt from the mandate should be exempted, not coerced." BTW, when the University of Iowa's Graduate Student Senate unanimously adopted a resolution in support of OA two years ago (March 22, 2006), it didn't distinguish non-fiction scholarship from creative writing either. Some of its statements could easily apply to both: The Student Senate "[e]ncourages higher education to support these changes through...reward mechanisms, and by providing incentives and support for those advancing alternative models." While I might buy the "reduced-odds-of-publication" argument for creative writing, I don't buy the embarrassment argument. Any kind of work, fiction or non-fiction, can embarrass its author years later. Students aiming for a master's or doctoral degree should submit work of publishable quality, and faculty should expect work of publishable quality. The risk of future embarrassment is part of the game, just as (for non-fiction scholarship) the risk of disagreement from others in the field is part of the game. Moreover, as I argued in my earlier article on OA for ETDs, this risk is a legitimate goad to produce good work: "All teachers know that students work harder and do better work when they know they are writing for a real audience --large or small-- beyond the teacher....OA gives authors a real audience beyond the dissertation committee and real incentives to do original, impressive work...." I'd be suspicious of any university that said a work was good enough to earn a graduate degree but not good enough to disseminate without embarrassing the author. Some of the blog protests of the Iowa policy are over the top. For example, Grendel writes, "It seems the UI means to place some deal with Google above the interests of its own students....You can't just hold someone's degree hostage until they agree to your sketchy deal with a big corporation." Like other schools that require OA for ETDs, Iowa wants the good work it nurtures to be widely available to others who can use or build on it. Google is one of many means to make OA work visible, and Google indexing does not require any kind of "deal" with the university. Iowa's motivation is the standard and commendable academic motivation to share knowledge, not to profit at the expense of students or even to profit at all. There may be reasons to rethink the policy for MFA theses. But let's keep the conversation on track. Update (3/14/08). Today's blogosphere is full of comments on the Iowa policy. Most criticize it. Some criticize it as applied to creative writing theses but support it for non-fiction works of scholarship, and some fail to draw this distinction. Some attribute dark motives to the university. Some repeat the embarrassing "embarrassment" argument. Some stick to the argument that OA may reduce the chances of future publication. As I said yesterday, I'm open to persuasion on the last point, and looking for evidence pro or con. Unfortunately, while many of the new blog posts repeat the dire prediction, none points to evidence. Update (3/14/08). The University of Central Florida is another school that mandates OA for theses and dissertations. But it may allow a five-year delay before the OA edition is released, in contrast with the two-year delay allowed at Iowa. Melissa Patterson's article in the Central Florida Future (thanks to Gavin Baker) doesn't say whether the new embargo would only apply to creative writing ETDs or to all ETDs. Update (3/15/08). Several bloggers (1, 2, 3) have criticized my suggestion that a two year embargo might be adequate for works of creative writing. They might be right. In recent days a number of people have been upset about what they believed was a plan by our library to publish the creative thesis work of students in our writing programs on the Internet without their permission. Let me say as simply and clearly as I can, there is no such plan nor will there be. I regret sincerely that we did not convey this message when students and faculty first voiced their concerns. Ms. Lopes said a separate thesis-deposit form will probably be drafted for graduate students in research programs. She is organizing a meeting for Friday to discuss open-access policies with students and professors in those programs. Update (4/11/08). Also see the advice of Karen Schneider, librarian and creative writer, written in May 2007, well before the Iowa controversy erupted. Posted by Peter Suber at 3/13/2008 11:12:00 AM. Update. Per Klaus Graf, all of the current top 20 papers (across all subjects, from the past 5 years) have OA versions online. Coincidence? Posted by Gavin Baker at 3/12/2008 01:29:00 PM. Public University Online is a Web site for links to OA video lectures, announced on March 7. The site appears to be human-curated. Comment. See also recent OAN posts on similar topics (1, 2). Posted by Gavin Baker at 3/12/2008 11:39:00 AM. Capture and document researchers� requirements for digital repository services to handle research data. Participate actively in the development of an interoperability framework for the federated digital repository at Oxford. Make recommendations to improve and coordinate the provision of digital repository services for research data. Initiate and develop collaborations with the different repository activities already occurring to ensure that communication takes place in between them. Raise awareness at Oxford of the importance and advantages of the active management of research data. Comment. We previously posted about the project's blog. Posted by Gavin Baker at 3/12/2008 11:23:00 AM. Scientists and educational institutions in a digital age must push back forcefully against the old paradigms for scholarly communications, or risk imperiling the course of scientific research. These speakers describe how traditional modes of publication have constricted public sharing of ideas on which scientific progress is based, and propose approaches more appropriate for a web-based world. As one of MIT’s top librarians, Anna Gold knows the harmful impact of exorbitant fees for science journal subscriptions, and the loss to research when scientists can’t access and build on their colleagues’ work. She envisions “new ways of using the record of science” that will enable sophisticated new forms of text mining; take advantage of semantically rich XML documents; and offer a cyber infrastructure containing “rich, flexible units of scholarly communication such as data visualizations. Posted by Peter Suber at 3/12/2008 11:11:00 AM. Rollins College is at least thinking about an OA mandate. After the Harvard Faculty of Arts and Sciences adopted its OA mandate, the Executive Committee of the Rollins Arts and Sciences Faculty asked Jonathan Miller, Director of the Library, to write a memo on the issues raised by the decision. Miller has posted the memo to his blog. Comment. Kudos to Rollins for asking and kudos to Miller for posting. I imagine that many colleges and universities took a similar step after the Harvard vote (one month ago today), and I'd be glad to publicize all those that are willing to go public. Posted by Peter Suber at 3/12/2008 10:29:00 AM. Posted by Peter Suber at 3/12/2008 10:15:00 AM. The World Intellectual Property Organization's Standing Committee on Copyright and Related Rights is meeting in Geneva on March 10-12. Included on the agenda was a discussion of exemptions and limitations to copyright. ... The [WIPO] Secretariat was requested to make, in addition of the existing study reports, a study on exceptions and limitations for the benefit of educational activities, including distance education and the trans-border aspect in it. The Secretariat was requested to organize, in conjunction with the next session of the SCCR, an informative session on existing and forthcoming studies. The Committee will prepare a more detailed work plan on this item in its next session. See also coverage at Intellectual Property Watch (1 and 2), blog notes by Sherwin Siy of Public Knowledge (1 and 2) and Manon Ress of KEI, and observer statements by KEI, European Digital Rights, Electronic Information for Libraries, Electronic Frontier Foundation, Public Knowledge, and Library Copyright Alliance. See especially the EFF and LCA statements for a discussion of potential impacts for access to knowledge. KEI's James Love reports that a group of WIPO members, led by the EU countries, seeks to load up the agenda at future Copyright Committee meetings, in an apparent effort to distract focus from progress on limitations & exemptions. For background on the context of limitations & exemptions and their relationship with access to knowledge, see my OAN post from March 8. Update. A group of developed countries, led by the United States, has announced its opposition to any norm-setting activities for limitations & exemptions, according to James Love and Manon Ress of KEI. Update. See also the statement by Consumers International and a final update by James Love. Update. See also the closing summary from Intellectual Property Watch . Update. See also the statement by the International Federation of Library Associations. Update. See also the coverage by SUNS (1 and 2). Update. See also the coverage by Robin Gross of IP Justice. Update. See also the official conclusions of the session and the background on the issue by Thiru Balasubramaniam of KEI. Posted by Gavin Baker at 3/12/2008 08:18:00 AM. On March 11, Create Change posted an interview with Carolyn Kenny in its Cases in Point section. Kenny is a professor of human development and indigenous studies at Antioch University and co-editor-in-chief of the OA journal Voices: A World Forum for Music Therapy . ... Tell us about Voices: World Forum for Music Therapy. How did this online journal come about? About seven years ago, my Norwegian colleague, Brynjulf Stige and I launched Voices We felt there was a need for a better way to network internationally. Today we have 22 volunteer editors from all over the world and a paid managing editor. We wanted a forum for encouraging dialogue and debate. We resisted the idea of being a research journal. We want content that will stimulate discussion. It�s amazing how many hits we get. Every month there are several thousand. It�s being used in classrooms and students are writing articles about it. It�s really exciting. How are the costs of publishing supported? Posted by Gavin Baker at 3/12/2008 08:10:00 AM. Rebecca Kahn, World Book Day and The Commons, iCommons.org , March 10, 2008. Posted by Gavin Baker at 3/11/2008 04:23:00 PM. Susan D'Antoni, Open Educational Resources: The Way Forward, released March 7, 2008. The report is the result of online discussions facilitated by UNESCO's International Institute of Educational Planning to identify priorities for the OER community. Posted by Gavin Baker at 3/11/2008 04:09:00 PM. Carol Parker, Institutional Repositories and the Principle of Open Access: Changing the Way We Think About Legal Scholarship, New Mexico Law Review, Summer 2007. Abstract: This Article begins by looking at the traditions and cultural values that make open access to primary legal sources and governmental information essential, and that make open access to legal scholarship the next logical step. This Article then traces the evolution of the open access movement that has given rise to institutional repositories, and which has become a global phenomenon affecting all academic disciplines. Further, this Article examines in detail the effects of applying open access principles to legal scholarship, current options for law schools wishing to establish a repository, and the growing number of law school repositories currently in existence. This Article explores how legal scholars use repositories in creative new ways to publish digital objects, changing the landscape of legal scholarship. Finally, this Article concludes that open access to legal scholarship is a principle that should be adopted by U.S. law schools because it is consistent with the American tradition of citizen access to government and legal information. ...Though a bit out of date now in some of its statistics, because things are moving so fast, this article gives a very good overview of OA and concludes that, no, Law Reviews are not a special case: Those articles, too, and their authors and institutions, would benefit from being self-archived in each author's Institutional Repository to make them OA. Posted by Peter Suber at 3/11/2008 03:18:00 PM. The NIH is hosting an Open meeting on public access (Bethesda, March 20, 2008). The purpose of the meeting is to air public comments on the new NIH OA policy. The agency is soliciting public comments in advance of the meeting, and about 50 commenters will be given five minutes each to present their comments to the meeting (total: four hours). Comment. This meeting is one NIH response to publisher complaints that the new policy is based on insufficient public consultation. (See my latest response to that complaint.) Publishers are sure to send in their comments, and it's important for friends of OA to do the same. In case it helps compose your comment, see my February newsletter article on the new policy. NB: the deadline for comments is March 17, 2008, at 5:00 pm EST. Spread the word. Posted by Peter Suber at 3/11/2008 01:42:00 PM. Project Description: Development of open source web tools for accessing online digitized collections in the humanities via a system that communicates with multiple database types while protecting the integrity of the original data sets. Posted by Peter Suber at 3/11/2008 01:00:00 PM. Our respective trade associations, representing the global community of scholarly publishers, support open dialogue and informed communication on the use of published material. Putting these principles into practice, we have engaged in discussions with the academic community and worked within our own community to encourage best practices in recognition of the needs of authors and their institutions. Publishers should be able to determine when and how the official publication occurs (in the journal or online) and to derive the revenue benefit from its publication and posting. Recent statements, recommendations and papers published by a number of organizations take the rhetorical position that authors of journal articles will not be able to use their papers for educational or scholarly purposes if they sign standard publisher journal agreements. The suggestion is made that authors of journal articles should attempt to amend standard publishing agreements to obtain greater usage and scholarly rights for themselves and their institutions. First, the publishers are right to point out that many journals already allow author-initiated self-archiving and other kinds of scholarly re-use. I point this out myself whenever it comes up. For example, as of today, SHERPA reports that 56% of surveyed publishers allow postprint archiving, and 67% allow either preprint archiving, postprint archiving, or both. However, the new document seems to suggest that funders and universities are wrong to take steps to secure permissions for OA --for example, as new policies at the NIH and Harvard do by asking grantees and faculty to retain certain rights rather than transfer full copyright to publishers. The STM, PSP, and ALPSP assert that "all" publisher programs and experiments with free online access are based on "grants of copyright". If they mean an unqualified grant of copyright, in which authors retain no rights, then it's untrue. It's even inconsistent with their own acknowledgment that many publishers permit author-initiated self-archiving. If they mean a qualified grant of copyright, in which both publishers and authors have the rights they need, then they beg the question. Which rights do publishers really need? Do they need more than the right of first print and electronic publication? If so, why? Do they really need to oppose the new permission-based policies of the NIH and Harvard? If so, why? They point out that they've already addressed some of these questions in their earlier document, Author and Publisher Rights For Academic Use: An Appropriate Balance (May 2007). That's true too, and I encourage people to read it along with my detailed critique in SOAN for June 2007. Posted by Peter Suber at 3/11/2008 09:58:00 AM. Steven Harnad, Open Access Koans, Mantras and Mandates, Open Access Archivangelism , March 9, 2008. Harnad frequently makes the claim that institutional repositories are the optimal point of deposit for self-archiving. Here, he defends this claim in response to criticism by Andy Powell. ... AP: most [IRs] remain largely unfilled and our only response is to say that funding bodies and institutions need to force researchers to deposit when they clearly don't want to of their own free will. We haven't (yet) succeeded in building services that researchers find compelling to use. We haven't (yet) succeeded in persuading researchers to publish of their own free will: So instead of waiting for researchers to wait to find compelling reasons to publish of their own free will, we audit and reward their research performance according to whether and what they publish ("publish or perish"). We also haven't (yet) succeeded in persuading researchers to publish research that is important and useful to research progress: So instead of waiting for researchers to wait to find compelling reasons to maximise their research impact, we review and reward research performance on the basis not just of how much research they publish, but also its research impact metrics. Posted by Gavin Baker at 3/10/2008 04:34:00 PM. Christopher Kelty, �Now you have two problems��: On mandating Open Access, Open Access Anthropology , March 9, 2008. ... If Harvard is the entity actually providing the work most widely, circulating it and allowing people to read it, what exactly does the [American Anthropological Association] or [Wiley-Blackwell] provide for you? Posted by Gavin Baker at 3/10/2008 04:22:00 PM. An archived version of the March 7 Webcast on Institutional Compliance with the NIH Public Access Policy: Ensuring Deposit Rights, by the Association of Research Libraries and the National Association of State Universities and Land-Grant Colleges, was made available today. Posted by Gavin Baker at 3/10/2008 04:19:00 PM. [After a slow start in 2002, the OU institutional] repository was reprieved in 2005, when [research support librarian Bill Mortimer] was appointed. Tasked with supporting Open University research staff, he launched an advocacy programme, and began attending faculty meetings. His pitch was: open access fits the ethos of the Open University like a glove, and benefits the university faculty as well as external researchers. The Open University was founded in 1969 by the then Prime Minister, Harold Wilson, and its mission is to be "open to people, places, methods and ideas", says Mortimer. What better demonstration is there of that than to support open access? [B]etween January and July 2006 alone, [Mortimer] harvested between 2,000 and 3,000 items from departmental databases. Today ORO has more than 6,000 records, including peer-reviewed journal articles, books and book chapters, conference papers and patents. For the Open University, the issue is whether to introduce its own mandate. "The university is currently reviewing mandatory engagement with ORO and is taking advice and guidance from other institutions and agencies that have developed such policies," says Heywood. "We expect to reach a decision by the summer of 2008." Posted by Peter Suber at 3/10/2008 03:53:00 PM. A portion of the 2007 Mellon grant received by NISO was designated to proactively foster new standards activities through a series of "Thought Leader" meetings, where a group of experts on a particular topic convene to identify potential areas for NISO to lead a standards-based or recommended practice solution to recognized barriers. Participants in the first Thought Leader meeting, held February 12 on the topic of Institutional Repositories, were Charles W. Bailey, Jr. (University of Houston), Catherine Candee (California Digital Library), Sayeed Choudhury (Johns Hopkins University), Paul Curran (Bournemouth University), Teresa Ehling (Cornell University), James Hilton (University of Virginia), Michele Kimpton (DSpace Federation), Larry Lannom (CNRI), and Rob Tansley (Google). The group proposed that a NISO working group develop a common deposit mechanism "tool" that would allow institutional repositories to capture objects as close to their creation point as possible. The capture of these objects should be part of a larger context that will allow for their exposure across a variety of domains, such as journals, subject matter repositories, and course management systems. Commercial versions of the tool might offer advanced functionality, such as deposit destination suggestions and rights management guidance. Content destinations from the different domain areas could make themselves eligible to receive the exposed objects by adhering to the developed standard or protocol. NISO could facilitate a common deposit pilot project for the protocol and, subsequently, the deposit process could be opened to any entities that adhered to the NISO-developed standard. Posted by Peter Suber at 3/10/2008 11:24:00 AM. In a move to encourage open education, MIT OpenCourseWare (OCW) and Elsevier have agreed to make available figures and text selections from any of Elsevier's more than 2,000 journal titles for use on OCW. Cecilia d'Oliveira, acting executive director of OCW said, "We hear from thousands of students, educators, and self learners everyday about how OCW materials have helped changed their lives. Offering additional resources to these people will make an even greater impact on open learning and education. We hope this agreement will inspire other publishers to join in these efforts to unlock knowledge and empower people around the world." I've praised Elsevier before for its experiments with free online access (most recently for WiserWiki and OncologySTAT), and I'm prepared to do so again. But I must say that the MIT deal is only good news if the snippets it covers exceed fair use. If they don't, then the deal has the harmful effect of codifying a lower ceiling for fair use. For example, three tables per article seems to exceed fair use, but the limit of 10 per volume seems to fall short. The limit of 10 tables per volume could easily work out to zero per article for many articles. This wouldn't be a problem if faculty could still take advantage of fair use to exceed the limits Elsevier lays down in this contract. But does the contract rule that out? And even if it doesn't, will the contract act as a de facto limit? On the other side, remember that Wiley once threatened legal action when Shelley Batts blogged one chart from one article. In that light, we can appreciate that at least the MIT/Elsevier deal creates a zone in which MIT faculty may freely use Elsevier material without the usual fear of liability, and therefore without the usual pressure (often amplified by university counsel) to give up on fair use and err on the side of non-use. What if you’re not at MIT? This agreement provides the terms under which we can publish Elsevier materials under an open license on our site and does not address circumstances protected by fair use. It is our preference to publish all materials under a clear and consistent license to ensure our site users understand how the materials may be used, and this agreement helps us to achieve that goal. Posted by Peter Suber at 3/10/2008 09:11:00 AM. Ellen Finnie Duranceau, Following Removal of DRM, MIT Resubscribes to SAE Database, MIT Libraries News , March 4, 2008. MIT faculty, students, and staff have access to the Society of Automotive Engineer�s technical papers over the web again, because the SAE listened to MIT and other universities when they spoke out against the imposition of Digital Rights Management (DRM) technology. Last spring, the MIT Libraries cancelled their web access to the (SAE) technical papers, because the society was imposing a DRM plug-in called FileOpen that seriously impeded normal scholarly use. Professor of Mechanical Engineering and SAE fellow Wai Cheng presented MIT�s concerns at the SAE�s Publication Board meeting in April 2007, which resulted in an immediate stay of DRM implementation on university campuses, and ultimately (November 2007) in a changed policy: FileOpen would not be required for university access to the SAE Digital Library. See also the comments at Boing Boing, and past OAN posts on this topic. Update. See also the story from Library Journal Academic Newswire . Posted by Gavin Baker at 3/09/2008 11:43:00 PM. Chris Rusbridge, Data, repositories and Google, Digital Curation Blog , March 7, 2008. ... So: in the first place, Google et al are unlikely to index data, particularly unusual data types. And in the second place, repositories encourage metadata, which does get indexed. So from this point of view at least, a repository may provide better exposure for your data (and hence more data re-use) than simply making the files web-accessible. Posted by Gavin Baker at 3/09/2008 07:37:00 PM. Posted by Gavin Baker at 3/09/2008 07:34:00 PM. The University of Minnesota Libraries have created a web page for NIH-funded Minnesota researchers on how to comply with the new NIH policy. This is a good idea. If you know of other campus-specific guides, please drop me a line. I'd like to publish a list in the April SOAN. There are several national guides that all campuses and researchers should know about, starting with the NIH's own FAQ on the policy. Also see the SPARC page on implementing the policy, the ARL Guide for Research Universities and, above all, Michael Carroll's white paper, Complying with the NIH Public Access Policy - Copyright considerations and options, from SPARC, Science Commons, and ARL. Posted by Peter Suber at 3/09/2008 01:13:00 PM.